Barack Obama held a town hall meeting in London in April. 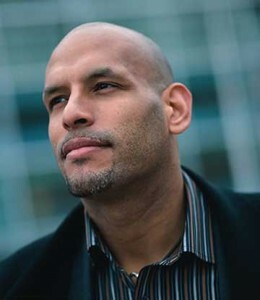 Among those in attendance was John Amaechi ’94. As he explained in a blog post, Amaechi was invited to the event by the U.S. Ambassador to the United Kingdom. Several minutes into the event, Amaechi was pulled aside by an aide because the President wanted to meet with him once the town hall ended. He watched Obama speak, then was led into a side room with a handful of celebrities. He ended his post by reflecting on his meeting with the President. Amaechi is no stranger to meeting politicians, as he’s received the Freedom of the City of London and is a member of the Order of the British Empire. Entry filed under: Athletics. Tags: Barack Obama, John Amaechi. Interesting, but who is he?